When in your house there is a new family member – puppy York, raises a lot of questions. How to care for a pet? How and what to feed a puppy? Where to arrange a place? How to play and what to do with the baby? Many people hesitate to get a puppy just because they are afraid that he will chew on furniture, destroying your stuff, barking, etc. meanwhile, it all depends on the upbringing and proper organization of the space of your pet. Organization bed for a puppy York Yorkshire Terriers and livery – known as a decorative dog, which requires little space in the apartment and they can settle for a small pillow placed in the right place. I do not advise to allow the puppy to sleep with You in bed for many reasons: because it is not hygienic; and because it is a small puppy with fragile bones and a jump from the height of the bed can turn to a toddler fracture or sprain. Right there is a place for York is a soft bench in the form of a house (York like mink and all sorts of secluded places). Well, if the rug You put near master's bed, after all, so the puppy will feel more secure and confident. The domestication of the puppy to the toilet When the puppy lives with his mother, who gently walks on the diaper in the toilet and leave there mark needed, puppy repeats after her. So the Yorkshire Terrier gets used to do all things linen. But it should be understood that the diaper does nothing for puppy. He knows the smell. Externally, the diaper for the baby is no different from under the door Mat or blanket on the bed. Therefore, at the moment accustom the puppy to the diaper in a new house, you need to be patient. And of course there are a few tips that can help in this matter. 1. The puppy and all the little kids goes to the toilet about every 20 minutes. So if You see that the puppy made a puddle, blot with a diaper that is prepared to pet her and put the diaper where they plan to organize the bathroom. After about 15 – 20 minutes, put the baby on the diaper, give it a sniff and see that the kid has done everything necessary where it is required. Be sure to praise the child for achievement. 2. But here You are again, found a puddle, don't scold the puppy, and put him in the diaper. It is important that this should be done immediately as soon as the baby went to the toilet. If the moment is missed and it took some time, the puppy simply will not understand than You are dissatisfied. And if You're too aggressive, it will produce fear in the baby and the puppy will look for secluded places for the toilet in order to hide this shame. 3. You should limit the space where it can be puppy. He's like a small child just does not have time to run to the toilet, and often to flirt. The smell from the diaper is only important if he is in range. In my personal experience: the dog easier to housebreak in the street. There is the instinct. If You are ready twice a day to walk your baby, the problem with the toilet very soon You will disappear. Really a diaper is to leave the puppy at home you still need at least months to 7 – 8, because the little puppy just can't wait until the next walk. The relationship with your puppy is Very important to establish the right relationship with your puppy in the family. A dog is a pack animal, for which in the first place is the leader. Your job is to be to the puppy's leader, to build a clear hierarchy in the family. This will keep Your house from many troubles. So how do you build a relationship with a dog. Puppy from the first days of life in Your house should know that the most important in the family is You with all the household and then the puppy. For this you need to observe the following rules: 1. The dog should eat only after you eat all the family members. Never throw anything off the table. The leader eats first, is this rule broken, everything else is just in vain. Don't worry, it humiliates and violates the feelings of the baby. He just knew that there was such an order. 2. Play with your puppy only on Your initiative. If the puppy You brought a toy, put it nearby and turn away, after 5 minutes, if you want, play with him. It is important that the initiative came from You. In the game do not give the dog to bite (or knock on), if this happens stop the game. Can only bite the toy. 3. Do not use many unnecessary words in relation to the dog when she scolded. She doesn't understand You. Choose one expression, for example, "very bad" and say it with the same intonation, so the dog knew that if it is spoken, that she did something wrong. A dog with normal mentality loves master and wants to please him. So it will be a severe punishment for Your "very bad". I don't have to yell at the dog, suffice it to say my "unhappy" phrase and the dog's tail depart. 4. The dog clearly should know their place. There should not be such that the dog to lie down on the bed in place of her husband or drives away from you Your child. And if this happens You must immediately stop such behavior, to indicate to the puppy in its place and allow your loved ones to take a convenient position. There are many different rules dressirovka and education of the dog, but if You follow at least the above mentioned, You will be able to provide You a comfortable shared accommodation and get pleasure from communication with each other. Feeding a puppy York On http://yorksite.ru/ (the website dedicated to the two wonderful breeds Yorkshire Terriers and bivera) contains a lot of information about how and what to feed York in a special section of useful articles - feeding. I recommend You to familiarize with the list of products prohibited for dogs http://yorksite.ru/chem-kormit-iorka. In this article I want to draw Your attention to key points in feeding puppy York: 1. You initially have to decide for yourself what You'll feed your dog dry food or natural. Mixing different types of feed is strictly prohibited, this is a very negative impact on digestion. 2. You should always remember that the Yorkie is a weak spot – the liver. It is impossible to give Yorkie and bevera fatty foods: fatty cuts of meat, fatty cheese, etc. 3. It is impossible to give York the tubular bones of birds, it is very easy to cause irreparable harm to the pet. Classes puppy Puppies Yorkies and beavers are, like all normal children are very active: they play, learn world. This activity did not cause harm to Your home, the puppy should be taught to play the right games and toys allowed. Puppies Yorkies, I love to bring the thrown ball or other toy. If you teach the puppy to like this game, then you will always have a way to get puppy to move and spend their energy on games with You. If the puppy is playing with Your things or starts to chew the toy Your son or daughter, You can safely remove a useless object and replace it with a toy puppy. The dog very quickly realizes that if she will take a chew toy, not a soldier, but it could be fun, and maybe even the owner leaves it for a bit, then scratch behind the ear. Of course, a wonderful time to be training a puppy. Yorkie and bevery very smart dogs and You can easily teach your pet simple commands such as "give paw" or "to serve." If you want to be able to teach him more complicated things. You can come up with different games puppy love to play. So many dogs love to play hide and seek and catch-up. The safety of the puppy is so very important question, which should explore new York host is safety. Preferably in the growth period of the puppy (up to 7 – 8 months) to limit it when You are away from home and he is alone. This not just will save many valuable things, but will protect the puppy. All the wires in the apartment needs to be cleaned. You can't raise a puppy on a hill and let out to jump. It can fail to do it and break a leg or get a sprain. For this reason, it is impossible to give the puppy to hold a small child, he can throw or simply to go with it. Toys should be made of a material from which the puppy will not be able to bite off small pieces. Watch your puppy hasn't vomited in a disposable diaper, which he left for the toilet. If the puppy eats them, then the damage may already be irreversible. On the street drive just a puppy on a leash. Even if he listens to You at home, on the street it might have something to scare or inspire. As a result, the puppy may fall under the wheels of the car or in the jaws of a large dog. And the main thing in raising children is patience. Puppies grow quickly and by 8 – 9 months to begin to perfectly understand what is required of them, what are the rules in the family. Ucdai You! And let the interaction between You and Your dog will bring lots of positive moments in Your life. Yorkshire Terriers – General Pets, funny dogs. Often they are treated as toys and not walking on the street, but just trained to go in the tray as cats. Hardly right to deprive the dog walks, but the need to teach puppies to the tray can occur when they have not yet learned to suffer long from celebrations to celebrations. Gonna put a Yorkshire Terrier mix in a limited area, for example, in the kitchen. Let him live there until you learn, in most cases, to do things in the tray. Lay on the floor 10-15 folded twice or three times of Newspapers. Catch the moment when the puppy wants to write, and set it on a newspaper. Newspapers change as pollution. If the dog went where necessary, actively praise him and reward with a treat. If shitting on the floor, scold, quickly remove puddles and piles, wipe the place of their localization with detergents. Buy some cat litter, place them so that the Terrier mix saw the trays. Let him play with them, even sleeping inside. When the puppy gets used to the sight of the trays, remove some Newspapers from the floor and cover their tanks-toilets. Some newspaper should be dry, but some are soiled with secretions of dogs to smell. Several times leave the puppy in the tray, much praise, if he did there. When the baby sits on the floor, carry it to the toilet. After a week remove from the floor all the Newspapers, wash everything with ammonia or lizoformin. Leave only the trays and gradually move them to the hallway or the toilet where you want them to stand constantly. Continue to praise the puppy for going to the tray and scolded for soiling the floor. Planted the dog in the tray after sleep and food. Over time, remove some trays to eventually left alone. Find wet Newspapers to dry. Males will sooner or later begin to lift his leg. The dog is not soiled apartment, place in the center of the tray-liter plastic bottle with water. The Yorkshire Terrier will be happy to mark it. 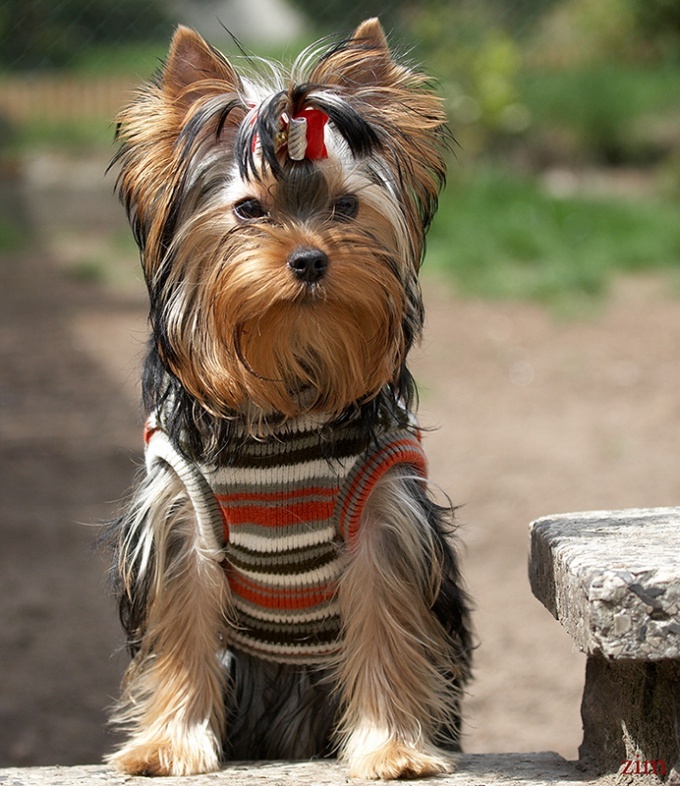 Yorkie is a very amazing dogs obtained by crossing different breeds of Terriers. While they were bred as ornamental Pets, unlike their predecessors, who hunted for rodents and small game. However, Yorkshire Terriers are quite energetic dogs who feel the thrill of the hunt, even if they are just chasing butterflies and sunbeams. Of York walking not very often, and just like cats, accustomed to the tray. Also it makes sense to teach young puppies to a certain place until, until they begin to walk on the street and suffering from walking to walking with a toilet. There are, of course, and careless owners who do not take the pet for a walk, but if they compare their just afraid the dog walkers brothers will understand what a serious mistake you have made. The technique accustom the puppy to the tray is simple enough. And the easier things will start to happen sooner and methodically you to this business get started. Ideally, in the moment when you are brought into the apartment of a puppy, immediately put disposable diaper in any place that suits you as a dog toilet. The main requirement for such a location is its accessibility to pet without someone's outside help, if it's a bathroom, its door should always be ajar. When the puppy will get used to going on the diaper, it is necessary to shift into the tray, eventually removing the diaper completely. Start to look very carefully at the dog, at a time when she will going to make your "small" business, it must be on the diaper and when she's there will do, immediately praise and cuddle. It is also desirable to catch the puppy, pristraivaetsya in the wrong place with the obvious intent, and exactly the same procedure to send where now is his toilet. In the first two weeks it is necessary to do it constantly, in no case do not scold the puppy, and don't forget to praise him methodically. Some repression can be entered only when pet is wholly knows where is his toilet, and what he should do. That is, if the puppy went to the location it is necessary to praise, but if he had been caught trying to celebrate the need in the wrong place, it should be a little scold and immediately drag to the tray. There again, to caress. At the same time to punish the pet only if he caught him in the process. But if he has time to move away from the crime scene, the beater will not work, the dog just does not understand what it is punished. If the choice was a Yorkshire Terrier, you should know something about the particular breed of this dog. Thinking ahead about the possibility of proper maintenance and care. To purchase a puppy – joyous and laborious affair, quite expensive. But this little joy is worth it! 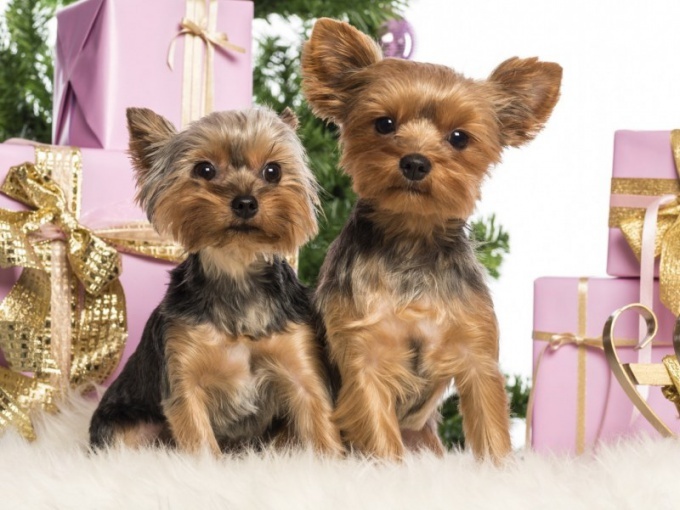 What you need to know about Yorkshire Terrier when you purchase. 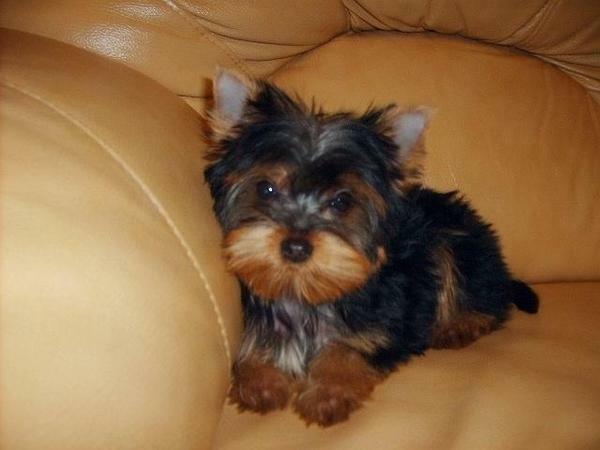 Yorkshire Terrier decorative dog breed small sizes. A great choice for keeping in the indoor environment. This is a very smart and delicate creature that requires care and love the owner. 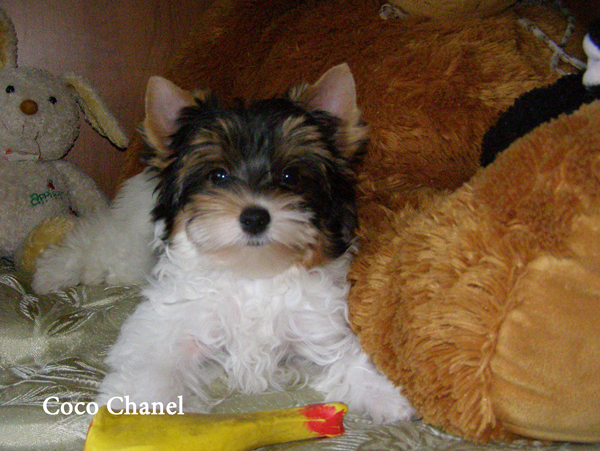 Before you get a puppy, you should study the demeanor of York's particular breed. Initially you need to decide on flooring and dogs. When choosing a Yorkshire Terrier you need to carefully inspect it and observe the behavior, how he behaves among his fellows. If too passive, this may indicate disease in the best case, a peaceful temperament. You should choose a healthy and active puppy. It needs to be playful and agile. Movements must be coordinated, back in this video. Need to see the puppy in full: the nose is usually black and cold - this indicates the health of the dog. Eyes of York is dark and a bit damp, looking forward, the pupils should be black or brown. The skin is smooth and healthy, without defects. Hair should be clean and shiny. She is a small puppy is usually black with gold markings. You must ask about the origin, we offer for sale puppies. A serious breeder should give sufficient information about the Terrier. Before purchasing an expensive purebred dog need to find out in what conditions it was grown puppies, as their mother, pedigree. You need to check the relevant documents on line. If the ultimate goal of the puppy purchase pursued his victory at various exhibitions, in this case, you should acquire the dog is older and trained. If possible consult with a proven expert. Many buyers prefer to make their own choices. But you should still heed the advice of those people who understand this. Puppies it is advisable to acquire in two months or three months of age. The dog needs to be vaccinated: this is evidenced by a special certificate from the vet. Where can you buy a Yorkshire puppy? When buying a Yorkshire Terrier should review the options to be fully confident in your choice. It is not recommended to buy puppies on the market or on Craigslist. There is a risk of deception. There is rarely provide guarantees on the purity of the breed or special required certificate of health. The price of puppies may vary depending on the characteristics of the dog and pedigree. Usually these dogs acquire in nurseries, clubs, private breeders. To the purchase was successful, you should learn to read the forums feedback and comments. And based on this you can make a choice. Details can be found from friends and acquaintances; perhaps one of them knows where to get a good puppy. Purchase Yorkshire Terrier is a real joy. They are loyal and faithful friends of man.